Finger foods are awesome, especially chicken fingers. They are great for everything from a game party to a wedding reception. You can eat them for dinner, you can eat them enjoying the big game, or you can watch them disappear into even the pickiest kids. Chicken fingers rule! My thing is that I don’t want to eat fried chicken fingers. Well, at least not this time. So how can I bake them and they still taste as great as the fried kind? 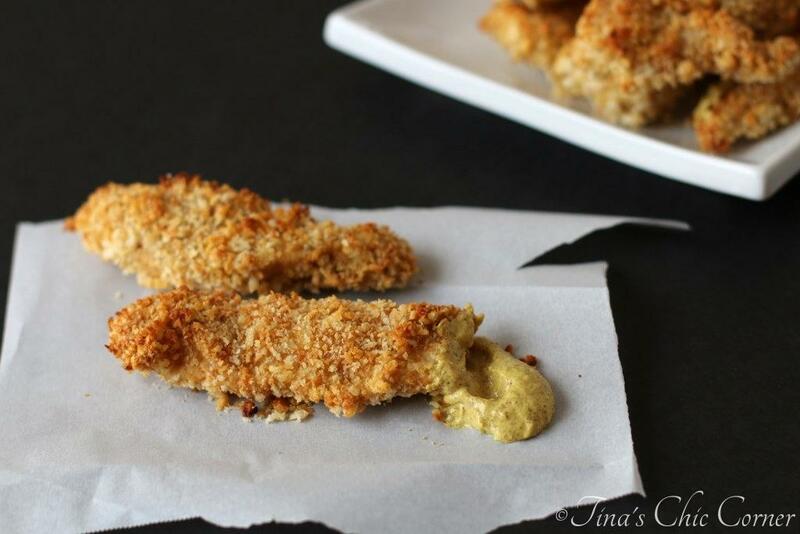 Meet these tasty baked chicken fingers. They are moist on the inside and mad crispy on the outside. In a large skillet, heat the oil on Medium heat. Add the panko bread crumbs and cook until the crumbs are gold brown, stirring constantly. Spray the chicken pieces with cooking spray and cook them for about 12 minutes or until the chicken is cooked. It’s a bit of a process to make chicken fingers at home, but it’s so much fun! I’m all about being neat and orderly so I set up an assembly line. 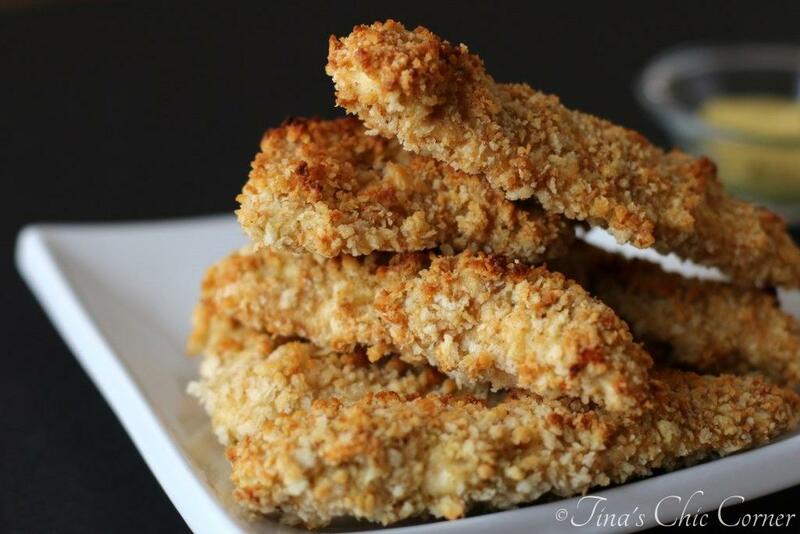 Cooking Tip #1 to Crispy Baked Chicken Fingers: Use panko bread crumbs instead of regular bread crumbs. They are bigger crumbs and they create more crunch. I used white panko bread crumbs, but you could also use whole wheat too. 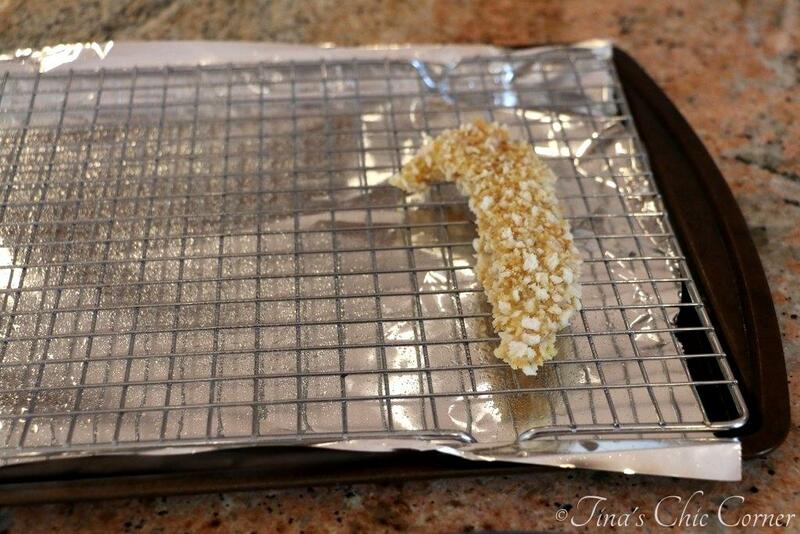 Cooking Tip #2: Lay the breaded raw chicken fingers on top of a wire rack (i.e. cooking rack). As the chicken cooks, the juices will fall away from the chicken onto the baking pan. Since the chicken fingers will not be sitting in the juice, they will not get soggy. The spices going on here are awesome. There is only a hint of cayenne pepper in them so they are not spicy at all. (AKA, these are totally kid friendly.) You could increase the amount of cayenne if you did want a bit of extra kick, but do so at your own risk. 😉 If you don’t like mustard, don’t worry because neither do I. It adds some great flavor with the rest of the spices and you can’t even taste it in the final product. These are the crispiest chicken fingers I’ve ever baked, and maybe even the crispiest I’ve ever eaten. If I closed my eyes while I was eating them, I would have sworn they were fresh out of the frialator at a fast food joint, except I don’t have the guilt that goes along with eating them. Hooray for a baked version! I’m all for less fat and calories in my food, especially when it doesn’t make them taste any less awesome. Pair these chicken fingers with some crispy baked Spicy Sweet Potato Fries and you’ve got a relatively healthy, and totally delicious, meal. Just saying. 😉 To be super healthy, you can also add these chicken fingers to a salad. I love how these are so versatile! I think these are ideal for the big game day coming up this weekend. What’s your must-have food for a game party? These look very crunchy. I am really trying to put away the fryer and you have shown me one more recipe that I can do that with. thx for sharing. My family loves chicken tenders and especially honey mustard! I love that these are baked 😉 Win win all around! That is some seriously crispy-looking baked chicken fingers! I see that taking the time to toast the breadcrumbs is worth the effort. I love to bake chicken with panko for my family but never tried toasting the breadcrumbs first. Great idea! Love me some chicken fingers! And your two tips for extra crispy baked chicken fingers are right on point! Panko is awesome and using the wire rack is such a smart move! Thank goodness for panko. They really do give an amazing crunch to everything they coat. And hurray for baked chicken fingers. I love baked over fried so much more. Especially since I don’t have to heat up a huge pot of oil and have my house stink like a donut shop the rest of the day. 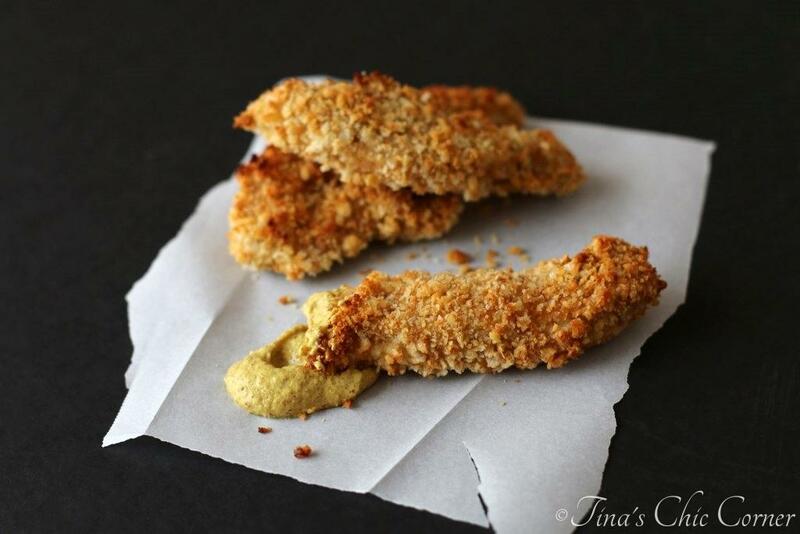 My lil guy and hubby love panko crusted chicken fingers and they would love how crispy yours look! 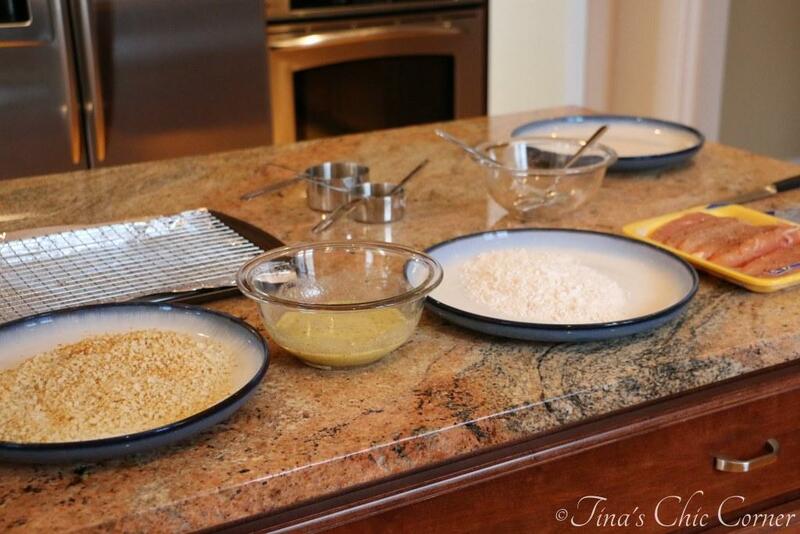 I use a wire rack too but love the idea of toasting the panko crumbs first and the spicy mustard sounds amazing! 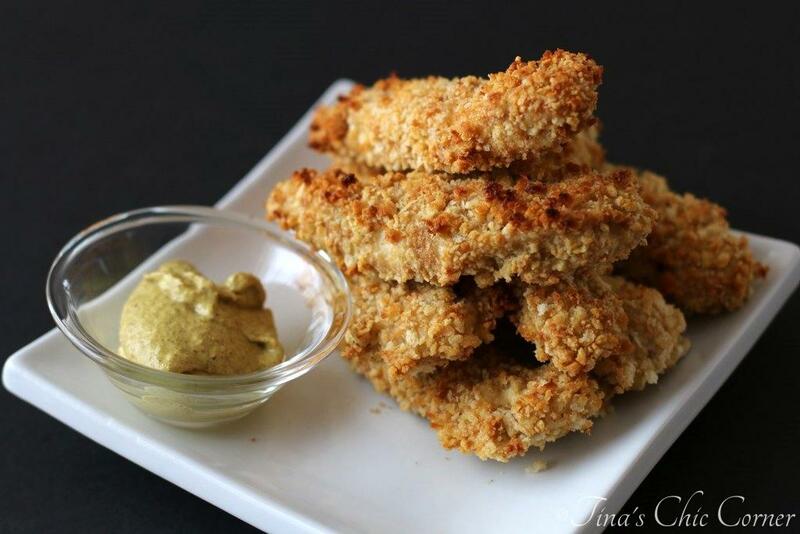 I love panko crumbs and I like how you used them in this dish… and they do look perfect for the big game!! Baked not fried = love it! I could see the.boy being very content with a platter of these! These look good, Tina! I was thinking about doing something like this for one of our Super Bowl appetizers. Thanks for the recipe! These ARE perfect for Sunday! They look delicious! Thanks for sharing.